APOSS SSC & Intermediate courses Admissions, APOSS SSC Inter Admissions/Registration fee payment due dates, APOSS SSC Admissions/Registration fee payment due dates, APOSS Inter Admissions/Registration fee payment due dates, APOSS Admissions/Registration fee payment due dates. Rc.No.625,Dt.23.12.2016 APOSS -SSC, Intermediate Exams Fee Due dates, APOSS, Rc.No.625/B1/APOSS/2016 Dated:-,23 -12-2016, Sub : APOSS- S.S.C & Intermediate courses-Admissions for the year-2016-17- Extension of due date for payment of admission/registration fee -Wide Publicity-Requested-Regarding. 1. This office Procs Rc.No .625/B1/APOSS/2016. dt 30-05-2016. 2. Note Orders of the Principal Secretary to Govt for School Education Dept & Vice-Chairman,A.P.O.S.S in file Rc.No.625/B1/APOSS/2016 dt : 19-07-2016 & 13-12-2016. All the District Educational Officers in the state are here by informed that, the due date for payment of registration/admission fee of S.S.C & Intermediate courses of A.P.O.S.S is extended with fine from 26-12-2016 to 29-12-2016 to all the aspirants. 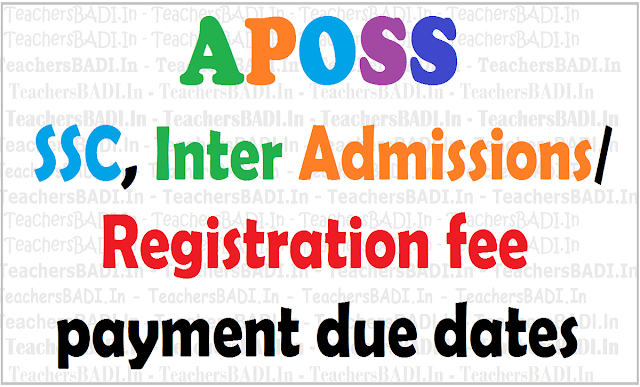 The facility of registration of applications is given to the District Educational Officers for speedy completion of admission process .The District Educational Officers in the State are requested to make necessary arrangements in this regard and inform to all the A.I Coordinators accordingly and ensure that the process of registration of applications is completed in smooth and transparency manner. Hence, all the District Educational Officers/ District Coordinators in the State are requested to issue Press/Media Note in their respective Districts for wide publicity among the learners and public with regard to extension of payment of registration/admission fee and also requested to arrange for scrolling of the above in the Electronic Media and submit the press clippings promptly. Top Priority should be give to this item of work.